Retailers are finding new ways to use virtual reality. While convincing consumers to use VR headsets for shopping may not exactly be mainstream, one retailer is extending shopper use of VR to employees. The latest example is from Lowe’s, which is using virtual reality to train employees in an extension of its Holoroom How To program created by Lowe’s Innovation Lab. Last year, Lowe’s launched in-store, VR-based skills training clinics in several stores. The aim of the Holoroom How To program was to teach customers basic do-it-yourself skills, such as supplies needed for a project and steps to complete one. Lowe’s found that customers have about a 40% greater retention of steps to complete a project when using the virtual reality training. Now Lowe’s is expanding that program with a new iteration to show associates how to use specific in-store equipment. 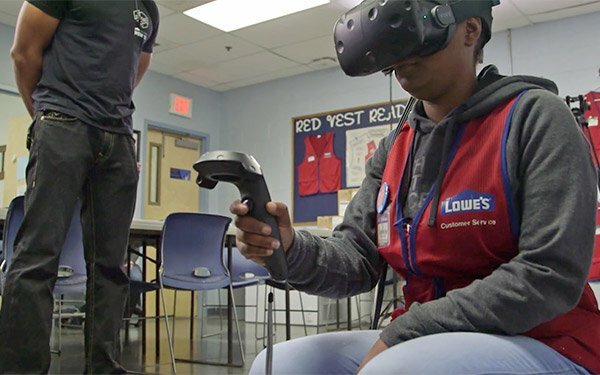 More than 400 employees have tested the VR platform and more than 90% have reported that the VR training would help them better serve customers, according to a statement from Lowe’s. This isn’t the first VR experience for retail employees. Last year, Walmart used virtual reality for employee training in more than 180 employee training centers. Walmart used the VR training to prepare for events such as Black Friday, operational procedures and learning customer service. Virtual reality is also being used for shopper marketing. Hershey’s chocolate used a virtual Walmart store set up by System1 Research to better understand how in-store signage and kiosks would impact consumer behavior relating to Hershey products. It’s not like virtual reality has moved to the head of the consumer electronics marketplace. For example, one study last year by Global Web Index found that only 5% of Internet users in North America had a VR headset. At a recent Walmart trip, I saw stacks and stacks of phone-based VR headsets marked down to $1 each. Hardly flying off the shelves. While most consumers at home may not yet be attuned to the various wonders of virtual reality, some may start to learn about them at work. 4 comments about "Lowe's Extends Virtual Reality Training From Shoppers To Employees". R MARK REASBECK from www.USAonly.US , February 6, 2018 at 9:18 p.m.
How about they work on BASIC Customer Service skills instead of video games? You can never find ANYONE in the dept you need help. OR, they have their head burried in a cell phone? OR, 12 of them bunch up with road flares , flourescent cones and Crash gates to block 3 aisles ? to move a pallet of toilet seats? Then forget to remove them. Maybe the VR is basically to eliminate their "virtual" jobs. Look at the money they will save on aprons. Chuck Martin from Chuck Martin replied, February 7, 2018 at 9:08 a.m.
Part of the training does involve customer interaction training as well as better use of in-store tech, as in using it to find a product for a customer, Mark. The retailer actually does have a robot in some stores that can lead a customer to a product, as well as continually track inventory. R MARK REASBECK from www.USAonly.US , February 7, 2018 at 9:18 p.m. Does it have an apron?? Chuck Martin from Chuck Martin replied, February 7, 2018 at 9:47 p.m.
No, but it has a screen, Mark.